In a sport like badminton, a racket with the right grip, balance, string tension and weight can provide a player with that extra flexibility or control needed to be a champion. 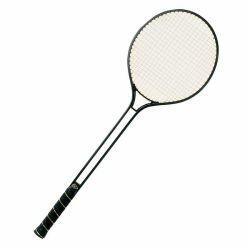 Champion Sports offers a wide variety of rackets for every need. This badminton racket features an all aluminum double shaft frame with a durable one-piece construction, nylon strings, and a dimpled leather grip.